It’s almost my birthday! Since I’m getting older, I don’t really want to make a big deal about it. Instead, drawing inspiration from a popular photo meme, let’s take this chance to look back ten years at the Ryan of the year 2009. What was this Ryan like? What was this pre-Hello!s Ryan doing? In order to find out some of these answers, and for the sake of your entertainment, I’ve trolled the depths of my social media account. 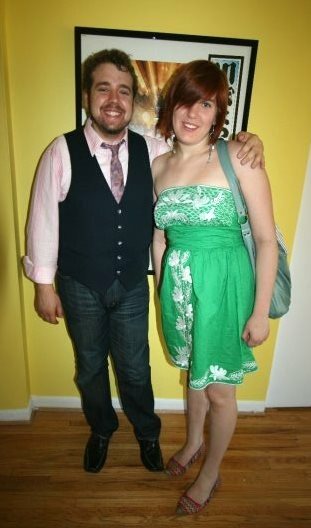 First off, here is a picture of me from that time, taken with my little sister Karalyn at her apartment in Chicago. Incidentally, this is one of my favorite pictures of the two of us together. Back then we were extremely good friends, and we’re still pretty tight, I think! But we don’t have the same nearly constant back-and-forth on social media that we seemed to when we were ten years younger. What I was eating in 2009: Lots of pizza, apparently. Also, I wrote scads about going to the farmer’s market, so I think I was eating and cooking a lot of local organic produce, including tons of beans and legumes (I was a very strict vegan at the time). It seems I was also into foraging, and reportedly ate wild mushrooms and raspberries, on occasion. What I was writing in 2009: Poems. I tried submitting my poetry to different literary journals, but it seems like they all got rejected. I guess it’s for the best! What music I listened to in 2009: I was in the throes of my Baroque-mania, which meant I was constantly plugged into C.P.E. Bach, Vivaldi, and Rameau. New experiences in 2009: I guess I learned how to drive stick shift. Being a cheapskate, I tried cutting my own hair in the mirror (starting an unfortunate series of self-inflicted choppy/uneven hairstyles). Low point of 2009: My apartment in was broken into while I was away at a family party. Out of all the things they could have taken, they decided upon my school bag, filled with my assignments, notebooks, and readings necessary for my school finals, as well as a USB drive with my final papers on it (and, less importantly, but still disappointingly, my iPod). High points of 2009: A bird built its nest against my bedroom window so I could closely watch it live its life and raise its chicks. I bought a harpsichord(!!!) at a very reasonable price. Also, I won the David Strauss Prize in American Studies at my college. I hope that this blast from the past was interesting to you and that you could get to know me (or, at least, the me of 2009) better!